Manitoba PNP is first Nominee Program began in 1998. Manitoba is celebrating the 20th anniversary of its pioneering Provincial Nominee Program, which has welcomed more than 130,000 immigrants since its inception in 1998. Eversince, MPNP’s came into effect in 1998, Immigration has been the main driver of the net positive population growth that Manitoba experienced since 2006. The province says its GDP would be 30 percent lower today without the economic benefit of this immigration boom generated by the MPNP, and immigrants who entered the province through its Business streams have invested more than $308 million in the province. According to the province, an impressive 90 per cent of immigrants are employed within their first year in Manitoba and around the same percentage stayed in the province. 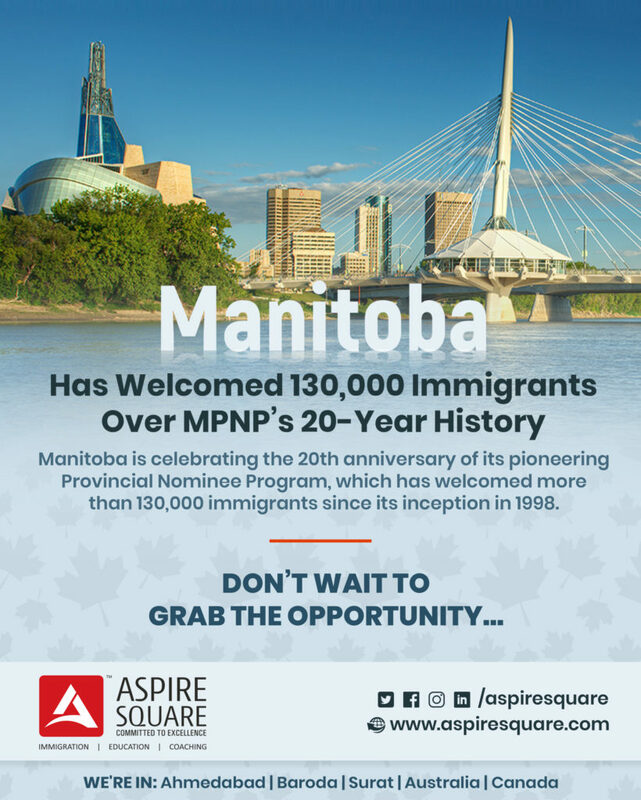 Over the past 20 years, Manitoba has continued to fine-tune the MPNP, introducing a nomination stream for business immigrants in 2001 and adding new skilled worker streams in the following years. The MPNP has now issued 1,155 invitations to apply for a provincial nomination to eligible Express Entry candidates since the stream has became active in January 2018. Being Canada Immigration specialist, Aspire Square would like to provide you the accurate and transparent advice for your Immigration process of Canada. To check your eligibility you may send us your detail on inquiry@aspiresquare.com or you can contact us on +91 88 66 88 07 07.